The theme this month is "Paths and Passages" and there are around 95 City Daily Photobloggers participating (Click here to view thumbnails for all participants). 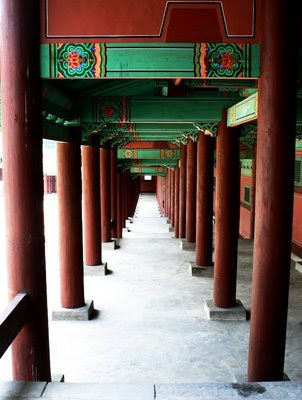 The photo above shows a passage running down one side of the Gyeonghui Palace (Gyeonghuigung). How beautiful this is.Wonderful colours. Super choice for today. I like the colors especially and it is a reminder of Japan and my time there in the early 1950s. I wrote in my Memories blog about the roads of my youth and how they were to travel in the winter time. Lovely choice! The painted design and cornices are gorgeous! Happy Theme Day! The colours are gorgeous against the snow. A beautiful choice for today. I love the colors with the snow and want to walk down this path to see where it leads. what a lovely pillared passage. Great depth to this photo.